The $40 “ThingCharger” interested us: There are more than a dozen kinds of chargers in stores and on the web but this one was different. It lets you plug in a regular device, like a blender, a toaster or a vacuum cleaner, at the same time as you’re charging your cell phone. 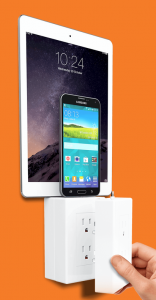 The ThingCharger plugs into an existing power outlet. To a casual observer, it’s practically invisible because it matches the look of the usual three prong outlet exactly. It has built-in storage for the adapters you need to connect Samsung, Apple, Nokia, Sony, LG, HTC, Kindle, Blackberry and other devices. The ThingCharger also has two outlets for USB devices. Watch the video at thingcharger.com to see how this works.